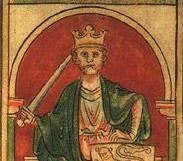 RIchard I was King of the English from 1189 until his death in 1199. He also ruled as Duke of Normandy, Aquitaine and Gascony, Lord of Cyprus, Count of Poitiers, Anjou, Maine, and Nantes, and was overlord of Brittany at various times during the same period. He was the third of five sons of King Henry II of England and Duchess Eleanor of Aquitaine. He was known as Richard Cœur de Lion or Richard the Lionheart because of his reputation as a great military leader and warrior. He was also known in Occitan as Oc e No (Yes and No), because of his reputation for terseness. Richard was a central Christian commander during the Third Crusade, leading the campaign after the departure of Philip II of France and scoring considerable victories against his Muslim counterpart, Saladin, although he did not retake Jerusalem. Most of his life as king was spent on Crusade, in captivity, or actively defending his lands in France. Rather than regarding his kingdom as a responsibility requiring his presence as ruler, he has been perceived as preferring to use it merely as a source of revenue to support his armies. He died on 6 April 1199 in the arms of his mother. AR Denier Aquitaine | Bordeaux? Obverse: +|RICA|RDVS|ω.in two lines across field, cross above, ω below. Reverse: +AQVITANIE, Cross pattee within inner circle.